Exploding Kittens plus See's Molasses Chips = game night perfection! We went to Tribeca Tavern on New Year's Day for a late lunch (after our 11 mile run) and were sad to discover that they no longer serve their amazing pancakes anymore. We survived with burgers, which were good, but dang - we'd been thinking about those pancakes for weeks! 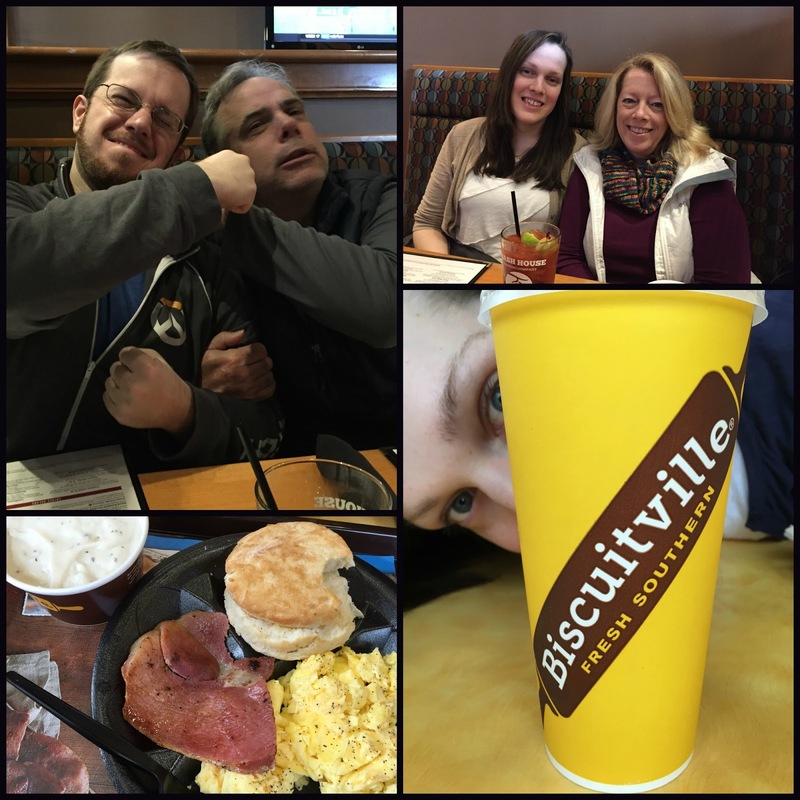 We also tried Biscuitville, which is only open until 2:00 pm each day (I guess no one wants biscuits for dinner?). It was good, and their cream gravy was every bit as delicious as you'd imagine cream gravy would be. Paco did really well at Sam's place, all things considered - it's a three-story townhouse, so we had to slow him down on the stairs as he seemed to limp a bit after a few days of raucous up-and-down jaunts, plus he had to be taken for walks instead of getting to run around in a backyard, but he adapted just fine except that he didn't eat much. Toward the last few days, I was petting him and realized that I could feel his spine more than usual; wouldn't it be nice to be able to lose that much weight so quickly as a human? This was what I saw most of the time on our drive back - his "Mom, please make dis stop" face. We took pity on him once again on the drive back and got Paco a sausage McBiscuit for breakfast. He ate the entire thing and then promptly went into a deep sleep...food coma at its best! 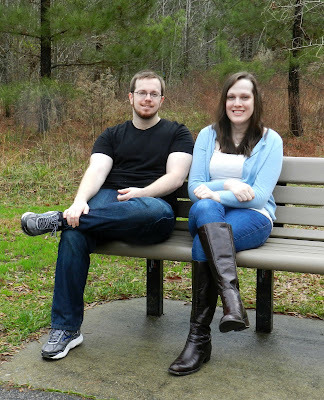 Finally, a family picture where we all look like ourselves! There's always one person in the crowd who can't keep it together long enough for me to set the timer and run back to pose for the shot! ...along with enough goofy shots that I ordered a 4x6 of each and will put them in a collage frame, because much as I like this picture, the goofy shots really show their true selves. Sadly, we had to say goodbye to Sam and drive back to Texas. On the drive out, we stopped in Birmingham, Alabama for the night (after 12 hours on the road), but on the drive back, we went all the way to Dallas. We started just after 6:00 am on Saturday morning, drove through North Carolina, South Carolina, Georgia, Alabama, Mississippi, Louisiana, and finally hit Texas, arriving at Allie's apartment in Dallas at 1:30 am. WHEW!!! That was one long day. The nicest part was when we stopped at Buc-ee's in Terrell, TX and got gas for $1.42/gallon. WHAT THE WHAT??? Now, it's really cheap by my house (I drove by Sam's Club and it was $1.59/gallon on Wednesday) but holy moly, that was nice. We woke up and were on the road by 8:00 am on Sunday, stopped for coffee at Starbucks (and came back to a VERY disappointed Paco, who apparently assumed he'd be getting yet another sausage McBiscuit), and were in our driveway at 11:30 am. 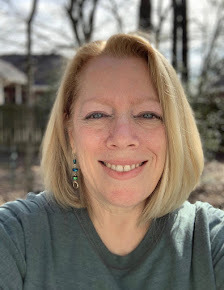 Life is getting back to normal now, but I have to say, all the driving was worth it...although I think we'll switch off and have Christmas in Texas this coming year. into a food coma just like us humans do. Have a good weekend. Any long runs on tap? Oh yes, we'll be running 5-7 miles tomorrow. What great family photos! 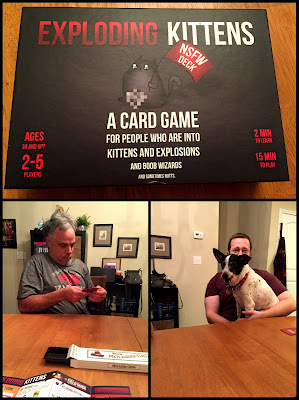 We bought Exploding Kittens and didn't enjoy it as much as I thought we would. Maybe we need to try it again. Give the game another try - we really liked it! What a wonderful time with your whole family together!!!!!!! So glad you got the family shots....so important! Yeah, I'm still paying twice that price for gas out here! Its so fun to see how much your family enjoys spending time together. I've never heard of that game. Gotta check it out. Well, to be clear, PACO was the one who lost weight in NC...I can guarantee you the same did not happen for me, LOL! love seeing your family all together and happy. I need to find that game. Sounds like so much fun. Our gas is mostly in the $2.20 range but the buzz amongst my local Facebook friends today is that BJ's has it for $1.97! 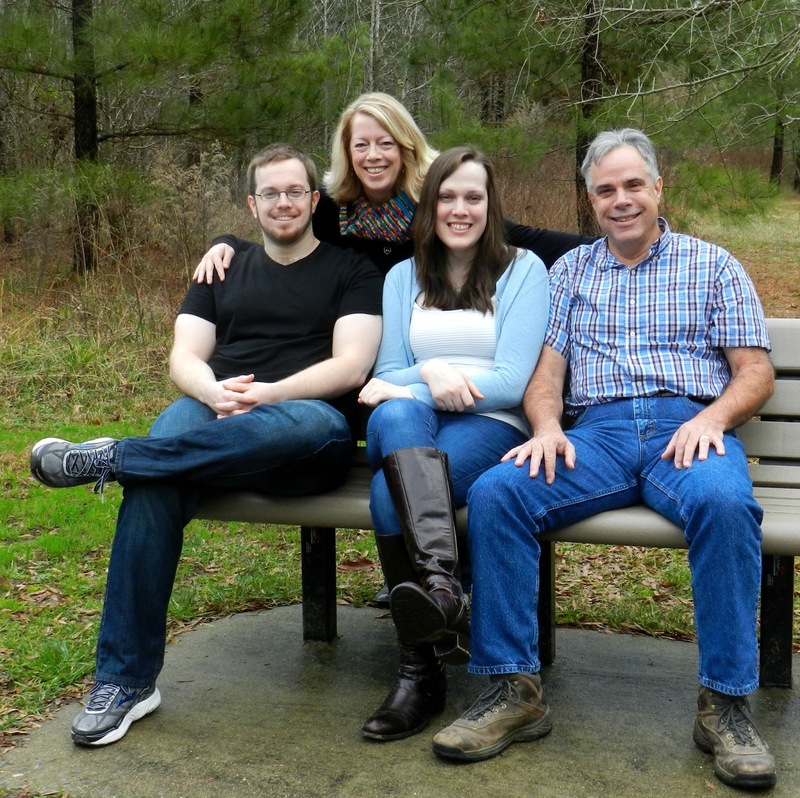 Love, LOVE the family photos, even the outtakes. What an absolutely lovely remembrance of Christmas 2015 they will be. I thought of you. I just tried knitting while on the exercise bike. Our family loves games, so we need to find that one! I am one of those kids who live not so close to home and I cherish the time when me and my parents and three siblings are all together!!! I am so happy you got this and hope you do again soon. And yay for taking family pics!!!! I just pulled our copy of that game out of storage to play! I hope we do! I heard there is a bit of strategy to it! I just love the fun family photos!!! You are all great!!! I bought exploding kittens for my son for Chritmas! But then he took it everywhere he went and then back to college and I still haven't played it.Love the family pictures! Priceless to have everyone under one roof! What a wonderful trip. I love the family photo shoot, great photos. My Mom lives a 30 minute drive away from us and my MIL lives in the same village as we do. Can't imagine seeing my Mom just once or twice a year. Paco is so darn cute, how can you resist that face.